The ECG is a tool of remarkable clinical power; it can be mastered with ease and can provide helpful and even vital information in a wide range of situations. One glance at an ECG can diagnose an evolving myocardial infarction, identify a potentially life-threatening arrhythmia, pinpoint the chronic effects of sustained hypertension or the acute effects of a massive pulmonary embolus, or determine the likelihood of underlying coronary artery disease in a patient with chest pain. One must remember that the ECG is only a tool and, like all tools, is only as capable as its user. The purpose of this course is to develop a foundation of the anatomical and physiological principles behind the ECG. Identify relevant cardiac anatomy involved in the ECG. 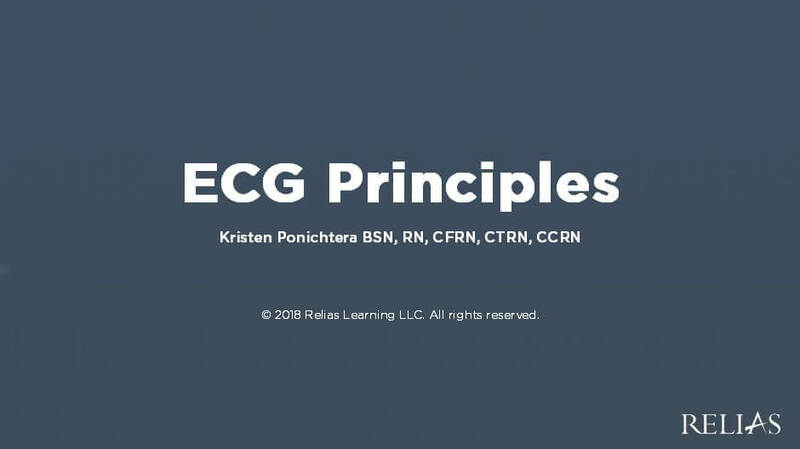 Discuss the electrophysical features of the ECG. Kristen Ponichtera BSN, RN, CFRN, CTRN, CCRN brings 10 years of clinical and educational experience in the fields of critical care, emergency and aviation medicine. Serving as Program Director of Flight & Critical Care Nursing Education, she has created original comprehensive educational courses as well as has contributed to best-selling publications. An active member of the Air & Surface Transport Nurses Association (ASTNA), the American Association of Critical Care Nurses (AACN), and the Society of Trauma Nurses (STN), she has been revered as a resource and mentor to many clinicians serving in these specialties. Fulfilling roles as a registered nurse, ECMO specialist, director and clinical educator, Kristen brings a unique and original perspective to the realm of medical education. Disclosure: Kristen Ponichtera BSN, RN, CFRN, CTRN, CCRN has declared that no conflict of interest, Relevant Financial Relationship or Relevant Non-Financial Relationship exists. David Hoeft, MD is a board certified Anesthesiologist at American Anesthesiology of New York. In addition to his strong background in physical and chemical sciences, David is actively involved in graduate medical education and research, and brings clinical and didactic expertise across the continuum of medical practice. Disclosure: David Hoeft, MD has declared that no conflict of interest, Relevant Financial Relationship or Relevant Non-Financial Relationship exists. The target audience for this course is: entry level Physicians; intermediate level Nurses; intermediate level Physician Assistants; in the following settings: Acute Care Facility.